Eurosport is using editing and publishing services from Grabyo to produce and distribute its social media output, a deal which included the PyeongChang 2018 Winter Olympics. Cloud-based Grabyo is part of the set-up for Eurosport’s content teams across key European markets, including the UK, Germany, France, Spain, Italy, Norway and Sweden. It enables digital teams to distribute highlights from live broadcasts directly to audiences on Facebook (pictured, above), Twitter, Eurosport.com and the Eurosport app. During PyeongChang 2018, Eurosport used the platform to provide audiences with key moments, highlights, storylines and reaction from across the Games. 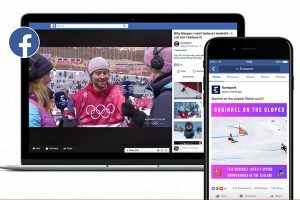 Eurosport also simulcast the broadcast of the Opening Ceremony on a number of its local Facebook pages using Grabyo’s Live Producer product. In addition to the video editing and publishing tools, Grabyo also provides Eurosport with a workflow that allows it to make money from social video on Twitter and Facebook. Clips cut from live broadcast feeds can be shared directly to Twitter and supported by sponsorship and in-stream advertising. Discovery holds the full multimedia rights for four Olympic Games, from 2018-2024, across Europe, with the exception of France from 2018 to 2020 and Russia for the duration. The Pyeongchang 2018 Winter Games were broadcast and distributed via Discovery’s Eurosport channels. Eurosport will be an official broadcaster in the UK in 2018 and 2020.